Believe in Jesus and you will inherit eternal life. This is what Jesus told Nicodemus. But look at the context of John 3:16 for a true understanding of the Gospel. The verse right before, at John 3:14-15, says: "And as Moses lifted up the serpent in the wilderness, so must the Son of Man be lifted up, that whoever believes in him may have eternal life." The people of Old Testament Israel were told to look upon the serpent to be healed of sickness and disease. But Christ was lifted up so that we can be healed from sin. We must be saved from sin. All sins are habitual. If we still sin, we must continue to look to the cross in order to stop sinning, in order to be healed from all our sinful habits, so that we no longer sin. Only then can we inherit eternal life. As we live and work for Christ the Holy Spirit changes us and we overcome all our sinful habits. Those who live and work for Christ will overcome all their sinful habits and will inherit eternal life. They will reign with Christ at the time of the resurrection, when Christ sets up his earthly kingdom. Now there was a man of the Pharisees named Nicodemus (John 3). Most of the Pharisees were very jealous of Jesus because of the miracles. The miracles drew big crowds to listen to Jesus. So, Nicodemus came to Jesus secretly at night to listen. Later, when they were trying to arrest Jesus, Nicodemus spoke up in his defense (John 7:45-52). After the crucifixion, Nicodemus helped Joseph of Arimathea bury the body (John 19:38-42). Joseph of Arimathea was a secret disciple. Most likely, Nicodemus was also a secret disciple of Jesus. 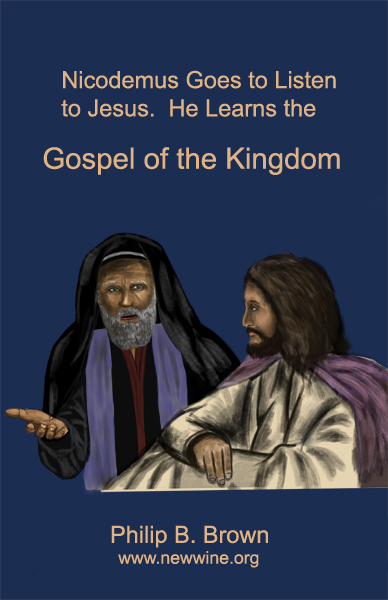 When Nicodemus visited Jesus at night, Jesus told him the Gospel of the Kingdom. Unfortunately, Nicodemus was a bit confused. When Jesus talked about being born-again, Nicodemus was forgetting a very important Old Testament context to which Jesus was referring. Jesus said, "Are you the teacher of Israel, and don't understand these things?" Unfortunately, most pastors today miss this context and do not know where in the Old Testament it talks about being born-again. Thus, they miss some very important points about the Gospel of the Kingdom. In the Old Testament, the prophet Isaiah (ch. 26) told us about the resurrection. In the future, the "earth will give birth to the dead." Literally translated, the spirits of the death come forth from the earth. But the context includes a metaphor of a pregnant woman about to give birth. Thus, many translations say the earth gives birth to the dead. This is what Nicodemus forgot. We get born-again bodies at the resurrection. Isaiah also told us, in the same chapter, that not everyone will be resurrected. Most people will be resurrected. But the enemies of God will not be resurrected. Daniel (12:2) was told that "many" will be resurrected, some of which will have everlasting life. To be born-again is to be resurrected. Jesus taught about two types of bodies at the resurrection. There are bodies of flesh and there are eternal-life spiritual bodies at the resurrection. Paul also talked about the two types of bodies at the resurrection. He asked, "How are the dead raised?" and, "With what kind of body do they come?" (1 Corinthians 15:35). It depends on the type of seed that is planted. Nicodemus was a Jew. He was taught that salvation is a journey of holiness back to Paradise, which in their (Septuagint) Bible was the Garden (Paradise) of Eden. Salvation is not about going to heaven. It's about going back to the tree of life in the Garden of Eden. The Messianic reign will be here on the earth. Jesus told Nicodemus that "no one has ascended into heaven except he who descended from heaven, the Son of Man" (John 3:13). Nicodemus would have understood Jesus to mean that he alone knew how to get back to eternal life in Paradise. Jesus reminded Nicodemus about the serpent that was lifted up by Moses in the desert. The people were told to look to the serpent in faith to be healed from sickness. Likewise, Jesus was lifted up so that we can be healed from sin as well as disease. Isaiah prophesied, "By his stripes we were healed. "nbsp; We must have faith in Jesus to be healed from sin, before we can get back to the tree of life in Paradise. Salvation is a journey of faith in Jesus Christ to be completely healed of the disease of sin. By faith, the Holy Spirit helps us to completely overcome all sinful habits before we can be born-again (resurrected) with eternal life. God so loved the entire world that he gave his Son Jesus Christ to be crucified on the cross so that everyone of all generations can be resurrected. In Adam all die, so also in Christ all will be made alive (1 Cor. 15:22). Christ's death was a ransom for sin, given to Adam and all his children. We can all be resurrected. But we must completely overcome all our sinful habits before we can be given eternal life. Those who become enemies of God will not be resurrected. Others will become enemies of God after the resurrection and will die a second death. They will be tormented in the lake of fire after the final judgment, which is after Christ's millennial reign. Jesus told Nicodemus that those who reject this faith are "condemned already." Those who truly understand about Christ's salvation, but deliberately remain enemies of God, become condemned even before the millennial reign begins. Being "condemned already," they will not be resurrected. But during the millennial reign, the wise, with spiritual bodies, will teach and reign over those who will still have bodies of flesh. Flesh gives birth to flesh. Spirit gives birth to spirit. We must be born again to see the Kingdom of God. The foolish virgins said, "Lord, Lord, let us in." Jesus replies, "Truly, I say to you, I do not know you. Watch, therefore, for you know neither the day nor the hour." (Matthew 25) How can the fact that these foolish virgins don't know the day or the hour possibly relate to the fact that they don't get into the wedding banquet? Is the problem really that they don't know the day or hour? The foolish virgins do not have as much oil in their lamps as the wise. Shouldn't they get caught up in the rapture no matter how much oil they have? Or is it because they don't watch the signs well enough? Does the fact that they don't study Daniel and Revelation cause them to be excluded from the wedding banquet? Apparently, something is here that the average Christian does not understand, which will cause them to be foolish virgins. But surely one's understanding of obscure points of doctrine shouldn't cause these virgins to be excluded. Most Christians believe they couldn't possibly be one of the foolish virgins because they claim to know Christ as their personal Savior. ' But does Christ really know them? ' The only difference between the wise and the foolish virgins, according to the parable, is that the foolish virgins do not have enough oil in their lamps. The foolish virgins believe they know Christ but they continue to sin. They will insist that continued sin in one's life will not prevent them from getting into the wedding banquet. Is this the foolishness that Christ is warning about? What does John say about those whom Christ does not know? Can we interpret John's words in the context of Jesus? 1 John 3:5-6 ESV You know that he appeared to take away sins, and in him there is no sin. (6) No one who abides in him keeps on sinning; no one who keeps on sinning has either seen him or known him. Matthew 25:11-13 ESV Afterward the other virgins came also, saying, 'Lord, lord, open to us.' (12) But he answered, 'Truly, I say to you, I do not know you.' (13) Watch therefore, for you know neither the day nor the hour. Believe on the Lord Jesus Christ and you will be saved (Acts 16:31). But what does that mean? Is it the Greek-like concept of intellectual knowledge? Or is belief a continual action? Is salvation a one-time event? Do we say we are saved and that's it? Do we repent of our sins one time? Or do we continue to work out our salvation with fear and trembling (Philippians 2:12-13)? Do we need to "endure to the end" to be saved (Matthew 10:22, 24:13 Mark 12:13)? Could it be that we must continue to look upon the cross for salvation? Again, the foolish virgins said, "Lord, Lord, let us in." Jesus replies, "Truly, I say to you, I do not know you. Watch, therefore, for you know neither the day nor the hour." (Matthew 25) How can the fact that these foolish virgins don't know the day or the hour possibly relate to the fact that they don't get into the wedding banquet? And how does watching the signs relate to knowing Christ as your personal Savior? Ask these questions to most pastors today and they won't have a good answer. And yet this very parable directly relates to whether individual Christians will get into the wedding banquet! The only difference between the wise and the foolish virgins is the amount of oil in their lamps. How can we know that we are a wise virgin and not a foolish virgin if our pastors don't really understand the parables? Matthew 13:10-13 The disciples came, and said to him, "Why do you speak to them in parables?" (11) He answered them, "To you it is given to know the mysteries of the Kingdom of Heaven, but it is not given to them. (12) For whoever has, to him will be given, and he will have abundance, but whoever doesn't have, from him will be taken away even that which he has. (13) Therefore, I speak to them in parables, because seeing they don't see, and hearing, they don't hear, neither do they understand. I'm not saying that our pastors today don't love Jesus. But Satan has deceived them into thinking that everyone, even believers, must continue to sin. But the Gospel of the Kingdom is that by the power of the Holy Spirit we really can overcome all our sinful habits. Our pastors deny this. When John tells us, that Jesus appeared to take away our sins, he doesn't just mean that our sins are forgiven. John means that we no longer have sinful habits. He means that we no longer sin. One pastor I know wrote a book on Radical-Grace or Hyper-Grace. He believes that Jesus was teaching during the "dispensation" of law and that things changed to a "dispensation" of grace at Pentecost. Apparently, under the Law, you could be "perfect as the heavenly Father is perfect" (Matthew 5:48), but under grace you cannot become perfect. Paul taught just the opposite! Jesus told the rich young ruler that if you want to be "perfect," he should sell all his possession and give to the poor. " Then, to be perfect, he should come and follow Jesus (Matthew 19:21). Most pastors today tell us that nobody is perfect. Many dispensational pastors believe that Jesus was teaching in a different "dispensation," when God had a different set of rules for salvation. They strongly argue that the teachings of Jesus on perfection was for a "dispensation" of law. So why would the "dispensation" of grace begin at Pentecost and not at the cross? The dispensational pastor I know said it's because after the cross, Jesus gave us the great commission. In the great commission, Jesus told us to teach people to obey everything that Jesus commanded. This dispensational pastor really believes the great commission was nullified at Pentecost! John, however, wrote long after Pentecost. John tells us how to know that we know him. We know Jesus if we keep his commandments. And we keep his commandments if we no longer sin. 1 John 2:1-6 My little children, I write these things to you so that you may not sin. If anyone sins, we have a Counselor with the Father, Jesus Christ, the righteous. (2) And he is the atoning sacrifice for our sins, and not for ours only, but also for the whole world. (3) This is how we know that we know him: if we keep his commandments. (4) One who says, "I know him," and doesn't keep his commandments, is a liar, and the truth isn't in him. (5) But whoever keeps his word, God's love has most certainly been perfected in him. This is how we know that we are in him. (6) He who says he remains in him ought himself also to walk just like he walked. Jesus told us that "on that day" there would be many "false prophets" who prophesy in his name, and even cast out demons in his name. A prophet is not just someone who speaks the very words of God. Pastors are prophets because they teach the word of God from their interpretations of Scripture. I'm not saying that pastors must interpret every aspect of Scripture correctly. But this issue of continuing to sin goes to the very core of the gospel because Jesus and John tell us that those who continue to sin don't know Christ! Most pastors today are unknowingly the wolves in sheep clothing Jesus said would come. Matthew 7:15-23 Beware of false prophets, who come to you in sheep's clothing, but inwardly are ravening wolves. (16) By their fruits you will know them. Do you gather grapes from thorns, or figs from thistles? (17) Even so, every good tree produces good fruit; but the corrupt tree produces evil fruit. (18) A good tree can't produce evil fruit, neither can a corrupt tree produce good fruit. Studies have shown that in evangelical churches today, there is no significant difference in moral habits between those who regularly attend church and the world around them. The fruit of the pastors is their flock. By their fruit, we will know them. The pastors today are not teaching how we can overcome all our sinful habits through the power of the Holy Spirit. Instead, they believe that nobody can overcome all their sinful habits. These pastors will be truly surprised, saying "Lord, Lord." They are surprised because they really believe they know the Lord. They really love Jesus because Jesus died on the cross for them. But they don't love Jesus enough to really take his words literally and seriously. They don't love Jesus enough to question all that's been taught by the false prophets that came before them. So, they unknowingly pass the false doctrines about the gospel of salvation along to the next generation of pastors. If you don't have faith that God can change you to be "perfect as the heavenly Father is perfect," then you have a form of godliness but you deny it's power to overcome sin. 2 Timothy 3:1-7 But know this, that in the last days, grievous times will come. (2) For men will be lovers of self, lovers of money, boastful, arrogant, blasphemers, disobedient to parents, unthankful, unholy, (3) without natural affection, unforgiving, slanderers, without self-control, fierce, no lovers of good, (4) traitors, headstrong, conceited, lovers of pleasure rather than lovers of God; (5) holding a form of godliness, but having denied the power thereof. Turn away from these, also. (6) For of these are those who creep into houses, and take captive gullible women loaded down with sins, led away by various lusts, (7) always learning, and never able to come to the knowledge of the truth. We can know the false prophets by their bad fruit. The foolish virgins are the bad fruit of the false prophets. The foolish virgins say, "Lord, Lord, let us in." They are also very surprised when Jesus replies, "Truly, I say to you, "I do not know you. Watch, therefore, for you know neither the day nor the hour." (Matthew 25) How can the fact that these foolish virgins don't know the day or the hour possibly relate to the fact that they don't get into the wedding banquet? You won't find the answer from the wolves in sheep clothing who also say, "Lord, Lord", and to whom Jesus replies, "I never knew you." But the disciples of Christ would have understood this parable. In their culture, God's people were expected to overcome sin before the coming of the Messiah. At the time of Christ, the Jews of Israel hated Roman rule over their lives and believed the Messiah would come to overthrow the Roman kingdom. The term "kingdom of heaven" or "kingdom of God" is a reference to the eternal kingdom that will begin here on earth when the Messiah comes. This can be seen in the context of Daniel 2, 7, 8, 9, and 12. We must interpret the words of Jesus in the context of their end-time centric culture. With these words of Jesus taken out of the context of Old Testament Jewish culture, the gospel of the kingdom can be misunderstood. In this context, the Church is not ready for the rapture. Many say sin was "put to an end" at the cross. But this is a requirement for "your people" and "your holy city." It's not something that Christ fulfilled at the cross. Vision and prophecy were not sealed up at the cross. Daniel had been praying for the forgiveness of Israel's sins and for the desolation of Jerusalem to come to an end. Seventy weeks of years (490 years) were decreed for God's people to completely stop sinning before the Messiah comes. We are grafted into Israel. Likewise, we must also completely stop sinning to be ready for the rapture. Israel was told when the Messiah would come. However, they failed to even recognize the Messiah and continued to sin. Therefore, seven of the seventy weeks were moved into the future for a second coming. The timing of the Messiah's return became unknown. They no longer knew the "day or the hour." But stating such would still mean we must stop sinning before Christ returns. We are told to watch the signs and be ready for Christ to return. That's the purpose of the seventy weeks. That's why Jesus tells the foolish virgins that he doesn't know them and to watch the signs. The foolish virgins were told they don't know the day or the hour because in that culture, they knew that all of Israel must stop sinning before the Messiah comes. The false prophets and foolish virgins will miss the rapture. They will not get into the wedding banquet. But that does not mean they will go to hell. They will simply live in the nations during Christ's millennial reign. This is like the watchman in the night. To watch for the enemy to come is to be ready. The enemy is sin. As we watch for the signs, we get ready by overcoming all our sinful habits. It's the wicked servant who will not know the day or the hour (Matthew 24:42-51). The wise servant will know when Christ will return. We watch for the sign of the great tribulation. Salvation is a journey of faith and belief in Christ. It's an active journey during which we become like Christ, who did not sin. One of the most well-known salvation verses is John 3:16. Read it in the context of John 3:14-21. Believe in Jesus and you will not perish but will have eternal life. But look at the context of John 3:16 for a true understanding of the gospel. The verse right before, at John 3:14-15, says: "And as Moses lifted up the serpent in the wilderness, so must the Son of Man be lifted up, that whoever believes in him may have eternal life." The people of Old Testament Israel were told to look upon the serpent to be healed of sickness and disease. But Christ was "lifted up" so that we can be healed from sin as well as sickness and disease. Sin is at the very heart of sickness, disease, and death. "By his stripes, we are healed" (Isaiah 53:5). John 3:16 is in the context of Jesus talking to Nicodemus. Later, we will look at this passage in more detail, and learn about being born again. We must be saved from sin. We become enslaved to sinful habits. All sins are habitual. Honest mistakes are not sins, because they are not habitual. If we still sin, we must continue to look to the cross to stop sinning, to be healed from our sinful habits, so that we no longer sin. We must daily take up our cross and follow Christ. Only then can we inherit eternal life. This journey, or process, is called sanctification. Romans 6:22-23 HCSB But now, since you have been liberated from sin and have become enslaved to God, you have your fruit, which results in sanctification--and the end is eternal life! (23) For the wages of sin is death, but the gift of God is eternal life in Christ Jesus our Lord. We are "enslaved to God." This means we do the Father's works. The fruit of this labor "results in sanctification," which means we become holy. It means we overcome all our sinful habits. The result of this journey is eternal life, according to this verse. Under the New Covenant, we do the works of the Father because that becomes our desires as God writes his law on our hearts. The Holy Spirit fills us and changes us on the inside so that we no longer sin. God can, and will, complete this work that he has begun (Phil 1:6). Galatians 6:7-9 HCSB Don't be deceived: God is not mocked. For whatever a man sows he will also reap, (8) because the one who sows to his flesh will reap corruption from the flesh, but the one who sows to the Spirit will reap eternal life from the Spirit. (9) So we must not get tired of doing good, for we will reap at the proper time if we don't give up. We must realize that continued sin is like a disease. Jesus can heal us from that disease. If you want to inherit the kingdom and eternal life, you must be completely healed from all sinful habits. We must believe that Jesus can heal us. If we say that Jesus can't or won't do this, then we do not fully believe in Jesus for salvation from sin. Just as the people of Israel looked upon the serpent for healing, we must continually look to the cross for healing. We must have faith and not doubt. We must turn our lives completely over to Christ to inherit the kingdom. If any sinful habits remain, then we have not yet finished our journey back to the Father. When no sinful habits remain, then we are completely sanctified. This is necessary before we can receive the gift of eternal life. 1 Thessalonians 5:23-24 ESV Now may the God of peace himself sanctify you completely, and may your whole spirit and soul and body be kept blameless at the coming of our Lord Jesus Christ. (24) He who calls you is faithful; he will surely do it. True believers are saved (sanctified) by God's presence and work in our lives. As we do the Father's works, the "God of peace himself sanctifies us completely" (by the Holy Spirit. After overcoming all our sinful habits, we are then ready for Christ to return. Notice that we don't sanctify ourselves. We don't make ourselves holy. It is the "God of peace" who sanctifies us. "Those who hunger and thirst for righteousness are blessed, for they will be filled" (Matthew 5:6 HCSB). I believe Jesus was saying those who really want to overcome their sinful habits will be filled with the Holy Spirit. The true meaning of grace is the presence or work of God. It's being filled with the Holy Spirit. Paul often started and ended his letters with something like "grace be unto you." It was like saying, "God be with you." Paul was not saying, "unmerited favor be unto you." Paul was asking for God's presence and/or works to be with us. Also, Christ was given grace as a young boy (Luke 2:40, John 1:14). He was not given "unmerited favor." The Holy Spirit was with Jesus. What is the difference between the Law of Moses and grace? The Law is God's written word concerning what is good and what is bad. Sins, however, are habit forming. People become slaves to their sins. Under the Law, they had to overcome their sinful habits through self-effort, as Paul describes in Romans 7. Under grace, believers can all be filled with the Holy Spirit. The Holy Spirit works on the inside to change us so that we no longer sin. We are filled with the Holy Spirit as we do the works of the Father. Grace is the presence and/or works of the Holy Spirit. Grace is not "unmerited favor" whereby we are simply forgiven of our sins. It's true that the blood of Christ ransoms us from sin. But sinful habits must be overcome. We need God's grace to change us. Ephesians 2:8-10 ESV For by grace you have been saved through faith. And this is not your own doing; it is the gift of God, (9) not a result of works, so that no one may boast. (10) For we are his workmanship, created in Christ Jesus for good works, which God prepared beforehand, that we should walk in them. This, and many other verses that speak of grace, can be vastly misunderstood if the definition of grace is misunderstood. It's by "God's work" that we are saved, through continual faith. It's not our own works, that no one may boast. We are "created in Christ Jesus for good works, which God prepared beforehand, that we should walk in them." As we do the good works, the Holy Spirit works inside us to make us holy. This grace/presence/work is the "gift of God." Philippians 1:6 being confident of this very thing, that he who began a good work in you will complete it until the day of Jesus Christ. Those who will inherit the kingdom are those who will have overcome all their sinful habits before Christ sets up his kingdom. They will reign with Christ, during the millennium, over those who don't overcome sin (Revelation 2:26). The point being, we need to go back to the basics of salvation and faith in Christ to completely overcome sin. Without holiness, no one will see the Lord (Hebrews 12:14). Israel was given 490 years to stop sinning before the Messiah would come. But they did so under the Law of Moses. The Law was given on Mount Sinai at the time of Pentecost. The Law defined sin. We were told to stop sinning by means of self-control and self-effort. Israel was scattered to Babylon for 70 years because Israel continued to sin. At the end of those 70 years, Israel was given 490 years to stop sinning before the Messiah would come. But Israel continued to sin. Under the Law, only a few "favored" were given the Holy Spirit. Everyone else was expected to stop sinning by their own power. But after the crucifixion of Christ, all believers were given the Holy Spirit. Again, this happened at Pentecost. Thus, Pentecost is all about the Law. The presence of the Holy Spirit makes all believers become "favored" by God. Thus, we are saved by grace instead of being under the Law of Moses. But the requirement remains to overcome all our sinful habits before the Messiah comes. The Holy Spirit is our Helper (John 13:26) so that we have the Power to stop sinning. Gentile believers are grafted into Israel. We stop sinning by faith in that Power. Titus 2:11-14 ESV For the grace of God has appeared, bringing salvation for all people, (12) training us to renounce ungodliness and worldly passions, and to live self-controlled, upright, and godly lives in the present age, (13) waiting for our blessed hope, the appearing of the glory of our great God and Savior Jesus Christ, (14) who gave himself for us to redeem us from all lawlessness and to purify for himself a people for his own possession who are zealous for good works. Under the Law of Moses, God gave us his written words as to what we should and should not do. To disobey is sin. Under the New Covenant, we must still overcome all our sinful habits. But God gives us the Holy Spirit as a Helper to change us on the inside so that we no longer sin. The New Covenant was prophesied to come by Jeremiah. Jeremiah 31:31-34 ESV "Behold, the days are coming, declares the LORD, when I will make a new covenant with the house of Israel and the house of Judah, (32) not like the covenant that I made with their fathers on the day when I took them by the hand to bring them out of the land of Egypt, my covenant that they broke, though I was their husband, declares the LORD. (33) But this is the covenant that I will make with the house of Israel after those days, declares the LORD: I will put my law within them, and I will write it on their hearts. And I will be their God, and they shall be my people. (34) And no longer shall each one teach his neighbor and each his brother, saying, 'Know the LORD,' for they shall all know me, from the least of them to the greatest, declares the LORD. For I will forgive their iniquity, and I will remember their sin no more." Hebrews 8:13 ESV In speaking of a new covenant, he makes the first one obsolete. And what is becoming obsolete and growing old is ready to vanish away. Notice that the New Covenant is with the "house of Israel and the house of Judah." Israel did not become obsolete. The Church did not replace Israel. Gentile believers are grafted into Israel. The need to stop sinning before the Messiah comes was not made obsolete. But now there's a new way to fulfil the Law. Instead of living under the Law of Moses, whereby we try to obey with our own efforts, we have the Holy Spirit as a Helper. This is living under grace. But we must still overcome all our sinful habits before Christ returns. Right after this New Covenant in Jeremiah, we have an affirmation that Israel is eternal. Jeremiah 31:35-37 ESV Thus says the LORD, who gives the sun for light by day and the fixed order of the moon and the stars for light by night, who stirs up the sea so that its waves roar-- the LORD of hosts is his name: (36) "If this fixed order departs from before me, declares the LORD, then shall the offspring of Israel cease from being a nation before me forever." (37) Thus says the LORD: "If the heavens above can be measured, and the foundations of the earth below can be explored, then I will cast off all the offspring of Israel for all that they have done, declares the LORD." Under the New Covenant, the law is "written on our hearts." That means our very nature is changed. Our habits of sin are overcome. The desires of our heart change from serving self and sin to serving the Father and our neighbors. This doesn't happen overnight. Salvation under the New Covenant is a journey that tends to take time. But it remains a journey that must be completed before the Messiah comes. Notice that the New Covenant states, "They shall all know me." This is opposed to the Old Covenant where, "each one teaches his neighbor and each his brother, saying, 'Know the LORD.'" In other words, the old is learned from a written Law. The new is a change of heart whereby we really know God. But the foolish virgins and the foolish false prophets don't really know Christ. They continue to sin. Nicodemus came to Jesus, secretly in the night. Most of the Pharisees would not admit that Jesus was a teacher who had come from God. But Nicodemus was open to Christ's teachings because of the miracles that Jesus was doing. If salvation is a journey, then one tends to naturally assume that to be born-again is the start of this journey. People would not generally say that one is born-again many times during the path of a journey. If salvation is not a journey, or if the journey is considered to be unimportant with regard to salvation, then one tends to naturally assume that to be born-again is a one-time event that transforms one's life into a person who is saved (past tense). Later, a person may rededicate one's life to Christ. But they are not considered to be born-again for a second time. The very term, "born-again," strongly suggests a one-time event and not something that repeatedly occurs during a journey. Jesus said, "I am the way, the truth, and the life. No one comes to the Father except through me" (John 14:6 ESV). The Greek word used here for "way" literally means "road." Thus, the verse can be translated as, "I am the [road], the truth, and the life. No one [journeys] to the Father except through me." The early church called themselves "The Way" (Acts 9:2, 19:9, 19:23). Literally speaking, the early church called themselves "The Road." They understood that Christian life is a journey. So, how does being "born-again" relate to this journey? Augustine believed that to be "born of water" is infant baptism. Without doubt, baptism is symbolic of dying and then coming up out of the water in a new life. Catholics today continue to believe that being born-again is infant baptism, and that this begins one's journey back to the Father. Catholics believe salvation is a journey to perfection, or sainthood. (The word saint, in the Greek, literally means "holy ones.") What happens if one doesn't complete their journey? Catholics believe that those who don't become saints must spend some time in Purgatory before entering heaven. This belief also goes back to Augustine. On the other end of the spectrum we have Evangelical Protestants, also known as Born-Again Protestants. Salvation is viewed as occurring in three steps: (1) justification, (2) sanctification, and (3) glorification. The justification step is when you become a believer and are born-again. Thus, to be born-again is to become a believer. One pastor asked me if I believe in "once-saved-always-saved." I replied that since salvation is a journey, the question does not make sense. To back up my point I stated that salvation is "justification, sanctification, and glorification," and that sanctification is a journey. He then rephrased his question. Do I believe in "once-justified-always-justified?" The point here is that to the Born-Again Protestant, becoming a believer is all that really matters. At that point you are "justified", and the amount of sanctification that occurs later does not determine one's final destiny. This view came about when Luther rejected Purgatory. If there is no consequence for not completing one's sanctification, then sanctification becomes unimportant. The completion of sanctification becomes something that is not possible, even though Scripture clearly says otherwise. That's why Born-Again Protestants don't believe that we can overcome all our sinful habits. My position is in the middle, between Catholics and Protestants. I do not believe that Scripture teaches Purgatory. But I do believe that Scripture teaches a free-grace alternative to Purgatory. During most of Church history, the high majority of the Church did not believe in the millennial reign of Christ. This included Luther and Calvin. So, they had no way of seeing that the millennial reign of Christ is a clear alternative to Purgatory, which is in fact taught by Scripture. The Messianic reign of Christ is also clearly taught in the Old Testament. But again, Luther and Calvin didn't believe in the Old Testament Messianic reign of Christ. The application of Old Testament Jewish eschatology to the New Testament Church solves this and six other major problems of Scripture, which have divided the Church over the centuries. But we must be willing to look at the New Testament with new eyes. How would the Old Testament Jews have interpreted the words of Jesus, John, and Paul? As we will see, Jesus is talking about two different types of bodies. There are bodies of flesh, and there are bodies which Paul calls spiritual bodies. "That which is born of flesh is flesh, and that which is born of Spirit is spirit." Jesus really is talking about literally being born again into a new body. Jesus is talking about the resurrection. We should interpret verse 5 along the same parallelism as is seen in verse 6. In other words, Jesus is simply clarifying himself. Being born of water is being born of flesh. When the mother's water breaks, the baby comes from the womb. Then later, at the resurrection, we can get a new spiritual body. 1 Corinthians 15 is Paul's famous chapter on the resurrection. Paul also talks about to types of bodies. 1 Corinthians 15:35-44 ESV But someone will ask, "How are the dead raised? With what kind of body do they come?" (36) You foolish person! What you sow does not come to life unless it dies. (37) And what you sow is not the body that is to be, but a bare kernel, perhaps of wheat or of some other grain. (38) But God gives it a body as he has chosen, and to each kind of seed its own body. (39) For not all flesh is the same, but there is one kind for humans, another for animals, another for birds, and another for fish. (40) There are heavenly bodies and earthly bodies, but the glory of the heavenly is of one kind, and the glory of the earthly is of another. (41) There is one glory of the sun, and another glory of the moon, and another glory of the stars; for star differs from star in glory. (42) So is it with the resurrection of the dead. What is sown is perishable; what is raised is imperishable. (43) It is sown in dishonor; it is raised in glory. It is sown in weakness; it is raised in power. (44) It is sown a natural body; it is raised a spiritual body. If there is a natural body, there is also a spiritual body. These words of Paul should be interpreted in the context of these words of Jesus to Nicodemus. But even then, there are two ways of interpreting these words. Paul asks, "With what kind of body do they come?" Do all those who are resurrected get heavenly bodies? Or do some get heavenly bodies and others get bodies of flesh? Does it depend on what type of seed is planted? Perhaps the just who die are one type of seed while the unjust are another type of seed. What does Paul mean when he speaks of the "hope" of the resurrection of both the just and the unjust (Acts 24:15). The answer comes from Old Testament context. John 3:8-12 ESV The wind blows where it wishes, and you hear its sound, but you do not know where it comes from or where it goes. So it is with everyone who is born of the Spirit." (9) Nicodemus said to him, "How can these things be?" (10) Jesus answered him, "Are you the teacher of Israel and yet you do not understand these things? (11) Truly, truly, I say to you, we speak of what we know, and bear witness to what we have seen, but you do not receive our testimony. (12) If I have told you earthly things and you do not believe, how can you believe if I tell you heavenly things? We have seen that Paul was talking in the context of Jesus. But Paul clarifies that being born of the Spirit is talking about the resurrection. We can get a spiritual body at the resurrection. Thus, to be born again is to get a new body at the resurrection. We will also get confirmation of this when we look at the resurrection in the Old Testament. With this understanding, consider what Jesus said in verse 8. "Those who are born of the Spirit can come and go like the wind." After the resurrection, Jesus appeared in the middle of a locked room (John 20:19). He could literally disappear from their sight (Luke 24:31, 24:36-42). When we are born-again into spiritual bodies, we will do the same. Also, Jesus characterizes these things as "earthly things." In other words, to be born again is not a spiritual conversion of the heart. It's a real-world literal event. After verse 12, Jesus begins with the "heavenly things." The "heavenly things" includes what it takes to receive eternal life. This includes John 3:16. Read it in the context of John 3:14-21. John 3:13-16 ESV No one has ascended into heaven except he who descended from heaven, the Son of Man. (14) And as Moses lifted up the serpent in the wilderness, so must the Son of Man be lifted up, (15) that whoever believes in him may have eternal life. (16) "For God so loved the world, that he gave his only Son, that whoever believes in him should not perish but have eternal life. Believe in Jesus and you will not perish but will have eternal life. But look at the context of verse 14 for a true understanding of the gospel. The people of Old Testament Israel were told to look upon the serpent to be healed of sickness and disease. But Christ was "lifted up" so that we can be healed from sin as well as sickness and disease. Now Let's go back and look at verse 9. Jesus seemed to be critical of Nicodemus for not knowing the Old Testament. Nicodemus was a Pharisee. But he didn't understand about the resurrection! The problem is that Nicodemus was not used to the resurrection as being born again. How many pastors are there today, who can tell you, where in the Old Testament it talks about being born again? Would Jesus say to them, "Are you the teacher of the Church and yet you do not understand these things?" The problem is that they do not think of "born again" in terms of the resurrection. But once you realize that we are born again into new bodies at the resurrection, it's not hard to find the Scripture. As we have seen, the unknown day and hour is better understood when Old Testament context is considered. Generally speaking, all the words of Jesus are better understood when interpreted in Old Testament context. Let's go back to Isaiah 26 for a better understanding about the resurrection and what Jesus meant about being born again. Isaiah 26:17-19 ESV Like a pregnant woman who writhes and cries out in her pangs when she is near to giving birth, so were we because of you, O LORD; (18) we were pregnant, we writhed, but we have given birth to wind. We have accomplished no deliverance in the earth, and the inhabitants of the world have not fallen. (19) Your dead shall live; their bodies shall rise. You who dwell in the dust, awake and sing for joy! For your dew is a dew of light, and the earth will give birth to the dead. This passage establishes the metaphor of the pregnant woman that is found throughout Scripture. Isaiah 66:8-9 refers to the pregnant woman in reference to the nation of Israel being born in a day. Isaiah is talking about the resurrection. "The earth will give birth to the dead." <>We will be born again. That's what Jesus spoke of in John 3:1-13. Jesus said, "That which is born of the flesh is flesh, and that which is born of the Spirit is spirit." (John 3:6 ESV). The wise will be born again with new spiritual bodies. This doesn't mean we won't have bodies. The wise will have heavenly bodies like Jesus after the resurrection. To be born again is to be resurrected. This prophecy of Isaiah concludes with the following two verses. Right after the resurrection is the wrath of God. Also, note that the earth will no longer cover its slain. Isaiah 26:20-21 ESVCome, my people, enter your chambers, and shut your doors behind you; hide yourselves for a little while until the fury has passed by. (21) For behold, the LORD is coming out from his place to punish the inhabitants of the earth for their iniquity, and the earth will disclose the blood shed on it, and will no more cover its slain. Hosea 13:12-14 refers to the pregnant woman in saying that many in Ephraim (the northern kingdom) will not be resurrected. They turned to other gods and did not repent. This passage is where Paul gets the saying, in reference to the resurrection, that "death is swallowed up in victory" (1 Corinthians 15:54-55). In the original chapter of Isaiah 26, verses 11-14 tells us that the enemies of God will not be resurrected. Isaiah 26:10-11,14 ESV If favor is shown to the wicked, he does not learn righteousness; in the land of uprightness he deals corruptly and does not see the majesty of the LORD. (11) O LORD, your hand is lifted up, but they do not see it. Let them see your zeal for your people, and be ashamed. Let the fire for your adversaries consume them. (14) They are dead, they will not live; they are shades, they will not arise; to that end you have visited them with destruction and wiped out all remembrance of them. This chapter of Isaiah 26 tells us, "the earth will give birth to the dead." Literally, the souls come from the earth. Some translations render it this way. Others use the context of the pregnant woman and say that the earth gives birth to the dead. But the wicked will not arise. Isaiah 26:19 HCSB Your dead will live; their bodies will rise. Awake and sing, you who dwell in the dust! For you will be covered with the morning dew, and the earth will bring out the departed spirits. Thus, we see this very early teaching about two regions in Sheol (Hades). This is seen in the parable of Lazarus (Luke 16:19-31). The parable describes a "great chasm" between the enemies of God and those like Lazarus. Does this mean the wicked in Hades are already in torment? No, when they awake from their sleep, they will be in torment in the lake of fire. Time is not perceived while asleep. The point of the parable, as given in the last verse, is that even if Lazarus were to come back and preach about the torment, the enemies of God would not repent. This was demonstrated when the real Lazarus was resurrected. No other passage associates Hades with torment. Instead, Jesus used the word "Gahanna" to talk about hell-fire torment. Gehenna was developed during the intertestamental period. It refers to the time of the end, and thus torment would have been understood to take place after the resurrection. After the millennial reign of Christ, the enemies of God will awake, be judged, and then thrown into the lake of fire, where there is no sleep day or night (Revelation 14:11). From their perspective, the dead wake up right after they die. Hades (Sheol) is death, not torment. Let's continue with our study of the pregnant woman. Matthew 24:8 speaks about the beginnings of the birth pains. The pregnant woman is about the time of the resurrection. The gathering of the elect (verse 31) is "immediately after the tribulation" (verse 29). Paul describes the time of the rapture in 1 Thessalonians 4:1, 5:10. This is in the context of grief over those who have already fallen asleep. The dead in Christ will rise first, before the rapture. Paul refers to the pregnant woman in verse 5:3. Revelation 20:4-6 tells us that the first resurrection is after the tribulation. And as we have seen, Paul tells us that the rapture is after the resurrection. So, the rapture must also be after the tribulation. Revelation 12 is all about the metaphor of the pregnant woman. The head of the woman has a crown of twelve stars. Twelve is symbolic of the twelve tribes of Israel. The woman is clothed with the sun, and the moon is under her feet. This comes from Joseph's dream in Genesis 37:9-10. In the dream the sun and the moon and eleven stars bow down to him. The dream was about his father, mother, and his eleven brothers bowing down to him, which was fulfilled years later after Joseph became a ruler in Egypt. So, the woman is Israel. The firstborn of the woman (Israel) is the resurrection of Jesus Christ. He is taken up to heaven. Satan makes war on the rest of her offspring. These are the people of Israel, including Gentile believers, who are grafted into Israel. The "earth will give birth to the dead." The people of Israel are the elect. They will be resurrected with heavenly bodies, like the angels. They are the wise ones who overcome sin before Christ sets up his kingdom. They are the Bride of Christ. They get into the wedding banquet. They are resurrected in the first resurrection. But after that, those in the nations who have not yet overcome sin can be resurrected. They are still under judgment. The foolish virgins who believe in Christ saying "Lord, Lord," and the false prophets who believe in Christ saying "Lord, Lord," will be resurrected in the second resurrection. They will have natural, mortal, earthly bodies like they have now. They will live with the nations. The foolish, who do not overcome all their sinful habits, can still be resurrected with mortal bodies. It's a resurrection of judgment because they are still under judgment. This second resurrection is in the "same hour" as the first resurrection. Then at the end of the millennium, the wicked who have rejected Christ will come to life and will be judged. They will be thrown into the lake of fire where there is "no rest day or night." Daniel 12:2 ESV And many of those who sleep in the dust of the earth shall awake, some to everlasting life, and some to shame and everlasting contempt. Notice that not everyone is resurrected. Many are resurrected, but not all. The wicked are not resurrected. Notice that they "sleep in the dust of the earth" and awake. This matches what's said in Isaiah 26:19, quoted earlier. Of those resurrected there are two groups. The first resurrection is for the wise unto everlasting life. The second resurrection is for the nations and is unto "shame and everlasting contempt." The Hebrew word used here for "shame" was often used for Israel. It's forgivable. The Hebrew word for "contempt" is not forgivable. In other words, they are still under judgment. Some will learn righteousness during the millennial reign. Others will not. John 5:28-29 ESV Do not marvel at this, for an hour is coming when all who are in the tombs will hear his voice (29) and come out, those who have done good to the resurrection of life, and those who have done evil to the resurrection of judgment. Both resurrections take place at the same "hour". This can be interpreted as the same time. (The Greek word can mean time.) These resurrections cannot be separated by a thousand years. The wicked will not be resurrected. Christ's sheep hear his voice. Even his lost sheep can still hear his voice. The wicked do not "come to life" until after the thousand years. They can no longer hear Christ's voice. Acts 24:14-15 ESV But this I confess to you, that according to the Way, which they call a sect, I worship the God of our fathers, believing everything laid down by the Law and written in the Prophets, (15) having a hope in God, which these men themselves accept, that there will be a resurrection of both the just and the unjust. Paul speaks of the resurrection of both the just and the unjust. Notice that Paul is speaking to his Jewish accusers. He was on trial. The fact that the Pharisees believed in the resurrection of both the just and the unjust is assumed in this passage. That's because the natural reading of Isaiah 26 is that almost all the dead who are in the earth will be resurrected. Isaiah is part of their Bible. We need to start interpreting New Testament Jewish authors in the context of their own Jewish Bible. This is not two resurrections separated by a thousand years. In Revelation 20, after the thousand-year reign of Christ, the word "resurrection" is not used for the souls who are awakened for judgment. It's not a resurrection because they are not being brought back from the grave to live again. A "resurrection of damnation" is an oxymoron. Why Did God Allow the Church to be Wrong? Any doctrine of Scripture that is different can be difficult to accept, even when it lines up with Scripture. Why would God have allowed the Church to be mistaken about the doctrines of salvation for all these centuries? But is not the Catholic doctrine of salvation very different from Protestant doctrines? Will Christ return and say one is right and the other is wrong? Has not God allowed at least one or the other to be wrong? The New Wine System is somewhere in the middle between the Catholics and the Protestants. Could it be that the truth hides in the middle? The word "Catholic" means "one", or "unity". John 17:9-11 ESV I am praying for them. I am not praying for the world but for those whom you have given me, for they are yours. (10) All mine are yours, and yours are mine, and I am glorified in them. (11) And I am no longer in the world, but they are in the world, and I am coming to you. Holy Father, keep them in your name, which you have given me, that they may be one, even as we are one. Has this prayer of Jesus been answered? Is it true today? Can we expect this prayer to be answered? Is it possible that there will be true unity in the Church before Christ sets up his kingdom? I'm not saying we will agree on everything. But we must agree on doctrines of salvation before we can be considered one, even as Jesus and the Father are one. I believe doctrinal error began to creep into the Church when the Church disobeyed Paul with regard to the Jews. The Church became more and more anti-Semitic throughout the centuries. Romans 11:17-18 ESV But if some of the branches were broken off, and you, although a wild olive shoot, were grafted in among the others and now share in the nourishing root of the olive tree, (18) do not be arrogant toward the branches. If you are, remember it is not you who support the root, but the root that supports you. The early Church became very arrogant towards the unbelieving Jews. They distanced themselves from the Jews, even to the point of excluding the Old Testament Scripture. They began to interpret the New Testament without considering the context of the Jewish Bible when the New Testament authors were themselves Jews. In the second century, there was even a movement to exclude the Old Testament from the Christian Bible. As we have seen, this causes the New Testament reader to misinterpret the Scripture. The Greek mindset Christians began to read concepts like Hades under Greek presuppositions instead of in the context of Old Testament Jewish understanding. Over time, the idea of a millennial reign of Christ became known as "Jewish superstitions." Old Testament prophecies about the Messianic reign became allegorical and interpreted as being about the first coming of Christ. This is called amillennialism and was predominate in both Catholic and Protestant circles. Millennialism regained some popularity when dispensationalism came along, starting in 1830. But even then, the dispensationalists separated Israel from the Church. The Church went to heaven in the pre-tribulation rapture while Israel could have their Messianic reign here on the earth. Centuries-old views of the doctrines of salvation could still be applied to Gentile believers without forcing the New Testament to be interpreted in the context of the Old Testament. Amillennialism goes hand-in-hand with supersessionism, also known as replacement theology. The Jews were considered to no longer be a part of God's plan. Even Martin Luther and Calvin were amillennial and thus believed the Jews were a problem for God. Luther became extremely anti-Semitic after the Jews made it clear that they would not join his Reformation. Hitler's case for the "Jewish problem" originated with Martin Luther. Without a restoration of Jewish (and Gentile) Israel, to reign with the Messiah, the words of Jesus and Paul about salvation become vastly misunderstood. Tradition is a very strong motivator. With amillennialism, eternity must be determined at the time of death because there is no millennial reign in order to begin or continue one's journey of salvation after the resurrection. This prevents us from accepting any notion that we must overcome all our sinful habits before the Messiah comes to set up his kingdom. John Westley believed in a form of Christian Perfection. But he considered it to be a "second blessing" instead of a journey of salvation. Luther had big problems with the book of James. He called it an "episcopal of straw." It didn't fit his understanding of grace. This made no sense to Luther. These verses should be on the walls of every church building. Without works, there is no filling of the Spirit, which is grace. Without works, virgins are deceived and remain foolish. Every Christian needs to have faith in God to make him "perfect as the heavenly Father is perfect" (Matthew 5:48). It's not just salvation from death. It's faith to be healed from sin before the Messiah comes. Overcome Sin, for the Kingdom of Jesus Christ is Coming Soon.